What is your travel style? Do you just want a relaxing tour or want to go on some adventure? Banos in Ecuador has a lot for your adventurous mind. 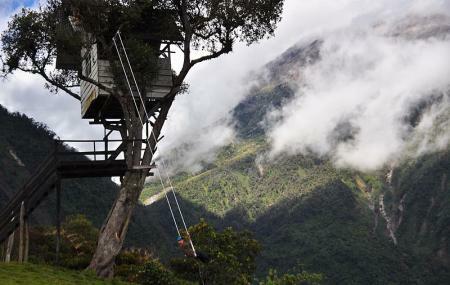 Amidst the Ecuadorian wilderness, La Casa del Arbol is a Seismic Monitoring Station. The purpose of this station is to let the tourists gaze at the spectacular views of the Mt. Tungurahua, the nearby active volcano, from its edge. Apart from this, the most interesting thing that most people enjoy is the swing hanging from the treehouse. The place welcomes adventurous swingers of all ages to for a swing ride. Wouldn’t you like to experience this wonderful thing? To personalise your visit to the city, you can use an all-inclusive Banos trip planner for the same that will give detailed information about visiting the city. You won't miss your home when in Banos, hotels in Banos like La Casa Verde Eco Guest House, Napolitano Apart Hotel, Sangay Spa Hotel and Casa Giralda offer some of the best places to stay in the city. Chalk out the best way to discover the city with Banos vacation packages. Check out various modes for how to reach Banos. How popular is La Casa Del Arbol? People normally club together Complejo Turistico Revolution and El Vuelo Del Condor while planning their visit to La Casa Del Arbol. You must go there when it is not foggy, because it is quite high and you will see nothing. It's 1 dollar to go in. After your 1/2hour there, I really suggest to go down the mountain with bikes, it is so fun and it goes pretty fast. Enjoy the ride and take few breaks as you go down, there is few nice spot. Very good! The men operating the swings are there to help you enjoy it to the max. And the tea at the top with cinnamon is a must try! Skip the beans if you're from the USA. Even been a really touristic attraction you can still find some great clear and quite days to enjoy one of the best views of the Tungurahua volcano! If you go in weekdays you have better chances to enjoy this place as it is! Really beautiful place, and of course the location of the iconic treehouse swing photo. I would recommend going very early as it gets extremely busy and accessing the swing may take a long time. Beautiful views and a fun place.